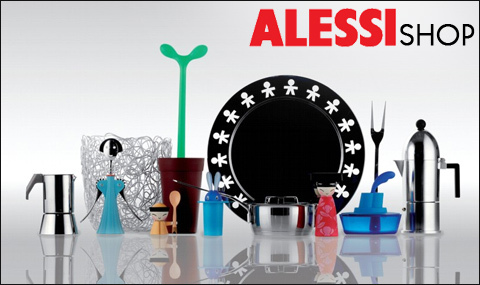 Kai products have a cult status in Japan with strong brand recognition. 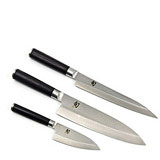 The company was founded in Seki in 1908 and has for 100 years developed and sold cutlery and related products of outstanding quality and sharpness.The common denominator in all their ranges is the centuries old art of Samurai sword manufacture. 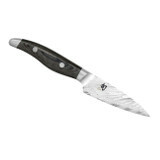 Constant technical innovation and a drive for aesthetic perfection give Kai knives their unmistakable quality. Thinking about Japanese cuisine inevitably leads to Sushi with its mix of fish and rice. The Japanese love fresh ingredients and are averse to long cooking times, They prefer the natural taste. Apart from fresh ingredients the aesthetic presentation of food is of great importance, even the smallest culinary delight is artfully prepared. 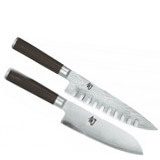 The right choice of Kai knife from this extensive range is essential to the joy of cooking. 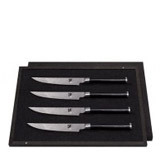 Kai Shun Knives - an extensive range of European shaped knives with Damascus steel blades and Pakka wood laminated handles. 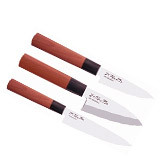 Kai Shun Pro Knives - a range of traditional Japanese shaped knives with VG-10 steel blades and Pakka wood laminated handles. 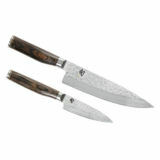 Kai Shun Kaji Knives- Kai's very best knives, feature Damascus steel blades and Pakka wood handles. Blades are double edged with a mirror polished finish.